This captivating letter was written by James Hastings Drennen (1817-1896), the son of John Drennen (1785-1822) and Mary Power (1783-1821). James was 4 years old when his father died, and he was reared by an uncle at Wheeling Township, Belmont Co., Ohio. At age 13, he was apprenticed to a cabinet maker in Pittsburgh, Pennsylvania. After leaving this trade, he settled at Mt. Pleasant, Ohio. Shortly after his marriage in 1841 to Isabella Ross Mitchell (1816-1884), he moved to a farm on Scotch Ridge in Pease Township where he farmed until moving to Martins Ferry. He was a Democrat, but later became a Whig, then a Free Soiler, and finally a Republican. He was a radical abolitionist and took delight in relating stories about the “underground railroad.” In later years, he owned and edited the Ohio Valley News in Martins Ferry. He was a member and is buried at the Scotch Ridge Presbyterian Church in Pease Township. Drennen wrote the letter to Capt. James Galbreath Theaker (1830-1910). James was born in Colerain Township, Belmont County, Ohio where he grew up and attended a private academy in Mount Pleasant. After attending a business school in Cleveland, Ohio, he returned to his home county, where he farmed and taught school until the outbreak of the Civil War. He served in the war from 30 August 1862 to 6 June 1865 and was wounded at the Battle of Franklin, Tennessee. In the course of his service, he was promoted to captain in Company F, 50th Ohio Volunteer Infantry. From his induction into the army until his discharge, James wrote many letters to various members of his family. In 1973 a collection of 95 of these letters were published in a book called, Through one man’s eyes; the Civil War experiences of a Belmont County Volunteer: letters of James G. Theaker. 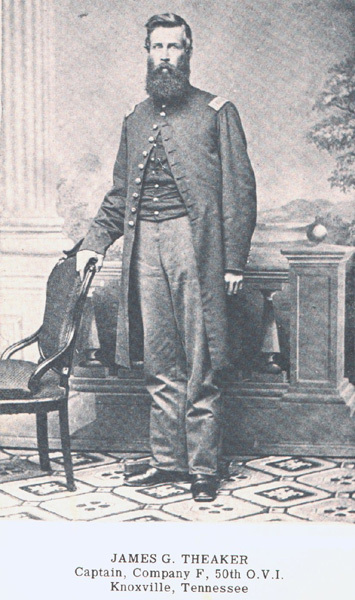 After leaving the army, James served for some time in Washington D. C., as secretary to his uncle, Thomas Clarke Theaker who was U.S. Commissioner of Patents. He then returned to his native Ohio and settled at Mount Pleasant. James married Martha Ellen Sharon 4 April 1872. I owe you an apology and a letter & I am going to give you both. Yours of July 15th found us right in the middle of harvest which was unusually late this year & no hands to be had so we had to improve every spare minute. I might have written after the days work was over; but I am getting old and writing by candle light is no pleasure & I wish corresponding with my absent friends to be a pleasure — not misery. We are not done hauling in our oats yet, but as this is a very wet morning, I am seated to give you the gossip of the day. As to the weather, it has been extremely hot — in fact, very hot. That, taken in connection with the serocco blast predicted by that eminent astronomer Abraham Lincoln on the 5th of September several of our eminently useful & highly patriotic citizens of Scotch Ridge have found it necessary to emigrate to the umbrageous shades of Canada. Your old friends Hugh Pickens & Athelbert Alexander among the number. It is said that their friends have received letters from them in which they represent the mingled odors of Royalty and runaway negroes of that remote province of her royal majesty Victoria the 1st as delightful. One thing is certain, the population hereabouts is so dense that we could spare “a few more of the same sort” without serious detriment either to our patriotism or loyalty as a community. As to the churches, the Martinsville congregation has got to so overrun with abolitionists, that those conservative christian patriots James G. Wiley and John Mitchell have found it necessary to demand their certificates that they may unite with Mount Pleasant, while Robert Finney refuses to attend or pay for the preaching of such an emasculated gospel, but fears to unite with Mount Pleasant though the fear that a taint of the moral leprosy may have crept in even there. Our township has raised $20,000 by private subscription and the Trustees have ordered a Township levy of $10,000 to pay a bounty of $300 to 100 men to volunteer and thus save us from the danger, disgrace, and expense of a draft. Dr. Sedwick has been commissioned by the Governor to raise a company, has opened an office in Martinsville, & has 8 sworn in with about 30 others who say they are ready & willing to enlist in their country’s service. The prospect is very fair the Dr. says for raising the men, as other townships are doing nothing — or comparatively so. Colerain was to have a have a meeting last Saturday evening to see what could be done, but I have not heard the result of their deliberations. Richland refuses to do anything & thus far Mount Pleasant has not made an effort. Talk of resistance to the draft is very common in the neighborhood, but I have not been able to trace it to any reliable source, and while I am free to admit that the copperheads are not altogether right in the upper story, I do not charge them with being such consummate fools as to make such a hair-brained effort. But if they should — why there will be occasion for parsons Olds & Medary to hang their churches in black for they will have lost many of their best members, and the copperhead candidates for public favor this fall will lose a goodly number of their warmest supporters. As to politics, I don’t know what to say. Locally the cops [copperheads] have nominated the present incumbent for Auditor, Sheriff & Commissioner while our party have nominated Davy Thorburn for Auditor who I understand in in the last stages of consumption & will probably not live till the day of election. Somebody in Richland Township was nominated who thought somebody else should have been nominated & declined the honor. Squire [Jacob] Holloway of Flushing is our candidate for Commissioner. He is said to be quite wealthy, very unfeeling, and ambitious & therefore unpopular; but for the truth of the assertion, I cannot vouch as I have always found him very much of a gentleman. The Cops [Copperheads] of course will nominate the Hon. Mr. [Joseph Worthington] White, the present incumbent, because he is disloyal and every way unworthy. Our men have re-nominated Hon. John [Armor] Bingham with Belmot County voting almost solid against him all the time, ostensibly because he has had it long enough and is unpopular, but really because he is antislavery — or rather was before the magnates of our party claimed to be so. We have some politicians in our county which I could wish were safely landed in Abraham’s bosom. As to the Presidential contest, if there really should be any, or if it should rise to the dignity of a contest, I cannot speak. I do not think the Butternuts & Copperheads can harmonize at [the] Chicago [Democratic Convention], but if they should, it is no matter. Old Abe can beat any nag they may trot out, out of his boots, and we are just letting him elect himself in this state as we have other matters to attend to than fighting shadows. And the opposition has not even presented a shadow unless we count Fremont as such, and if he has a single supporter in the state he has failed to make himself heard. I suppose you knew that Robert Amrine had sold out and gone to the West and James Steer has also sold to Lupton — his brother-in-law — and was to start today to Bainesville where he has purchased a large farm at $13,000. ¹ Drennen does not mention the unit by name but I believe he is referring to the 170th Ohio National Guard that was activated during the summer of 1864 for 90 days. They were engaged in a battle at Snicker’s Ford in July 1864 before being deactivated after 90 days service. See also — 1864: William Porter Phillips to Richard Lyons. This entry was posted on Monday, November 9th, 2015 at 7:02 pm	and posted in Uncategorized. You can follow any responses to this entry through the RSS 2.0 feed.